Yeah, what about chocolate? And peanut butter? Together. 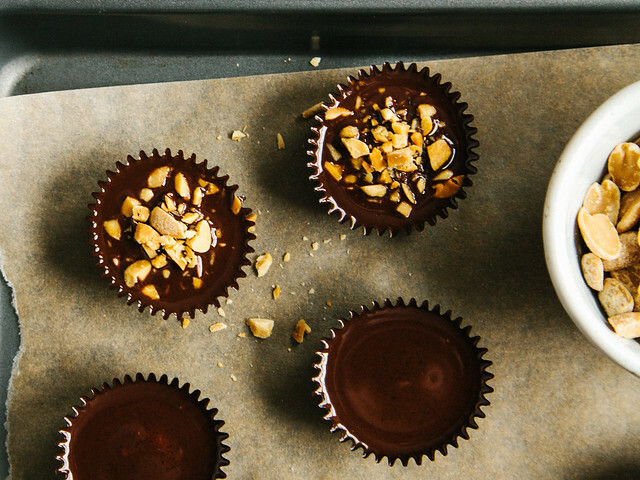 And now, crunchy dark chocolate peanut butter cups. Because I finally broke up with my nightly pack of Justin's after a few too many that were filled with peanut butter that had a consistency reminiscent of chalk. 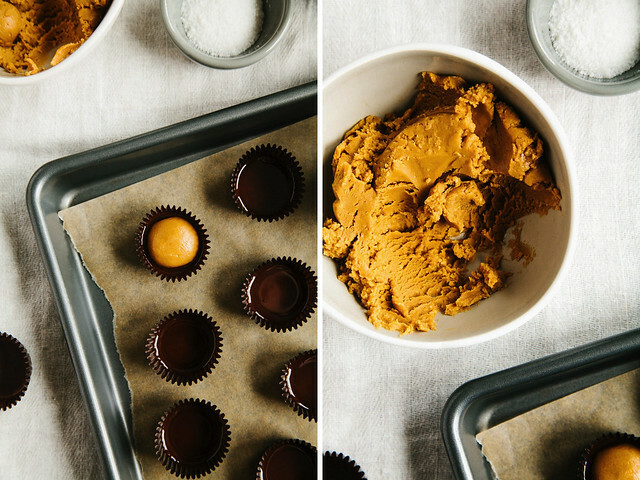 Notes: Using creamy peanut butter is pretty crucial to getting a consistency that's smooth and not too crumbly. However, I did use Justin's almond butter and enjoyed the texture but added a tablespoon of warm almond milk to help thin it out and omitted the nut meal (but mixed in 1-2 tablespoons of chopped almonds, instead). 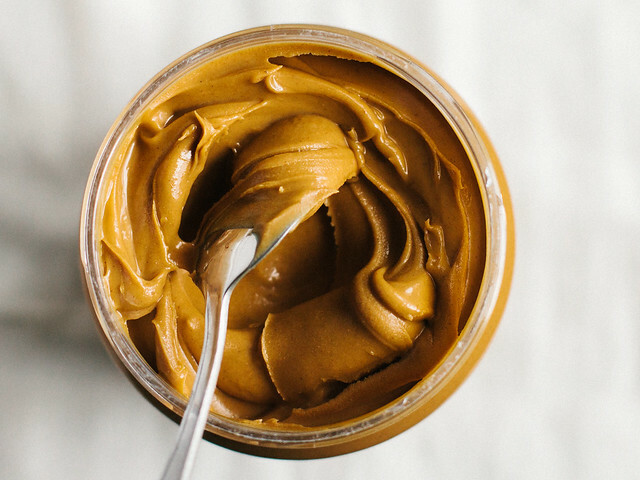 Speaking of other nut butters, feel free to use any one you can get your hands on. If you don't have small paper liners, you can easily use cupcake liners but I highly recommend trying to get your hands on the little guys. 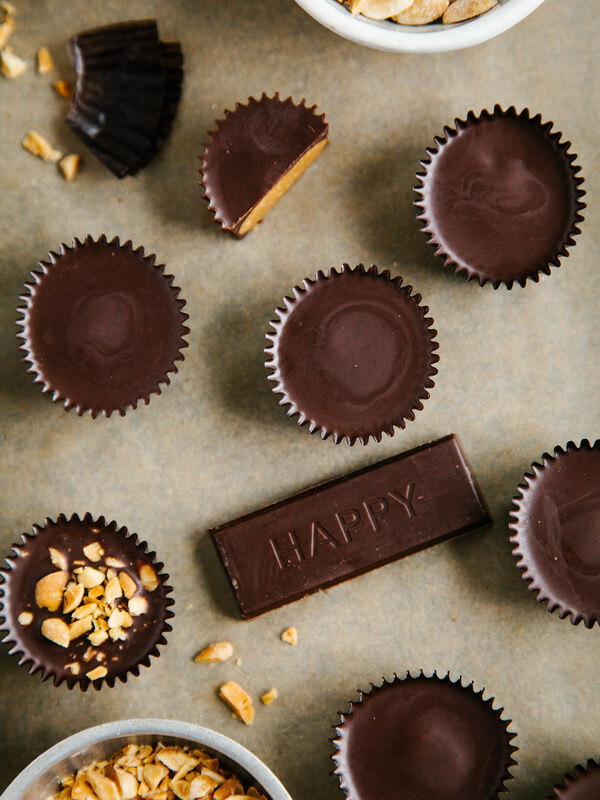 I like my peanut butter cups to be chock-full of peanut butter goodness, but if you'd prefer something with a bit more chocolate, reduce the peanut butter to just one scoop (instead of 1 1/2). This post is sponsored by ALOHA. All opinions are my own (and I think ALOHA chocolate is delicious). 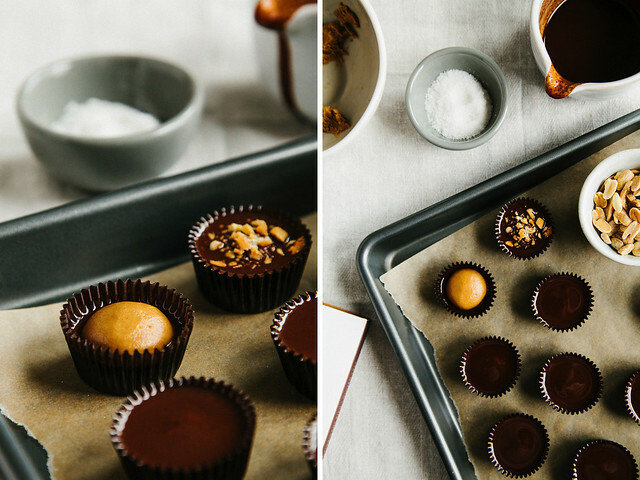 Line a small baking sheet with parchment paper and #5 paper candy cups; set aside. 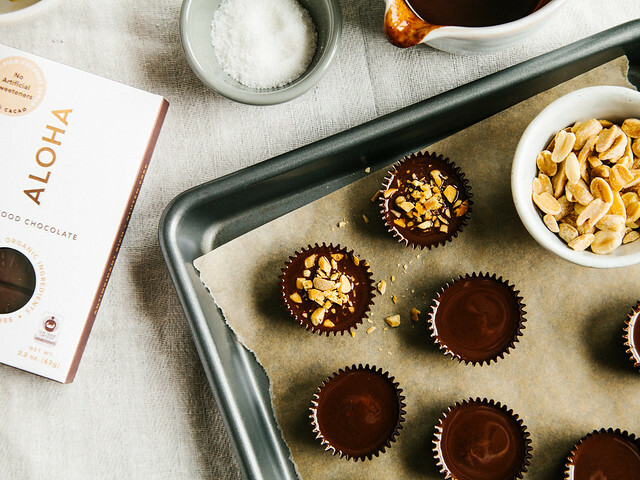 In a double boiler over medium heat, melt the chocolate and coconut oil. Transfer mixture to a small cup with a spout and put aside to cool for about 10 minutes. In a small mixing bowl, stir together the peanut butter, maple syrup, peanut meal, roughly chopped peanuts, and sea salt. 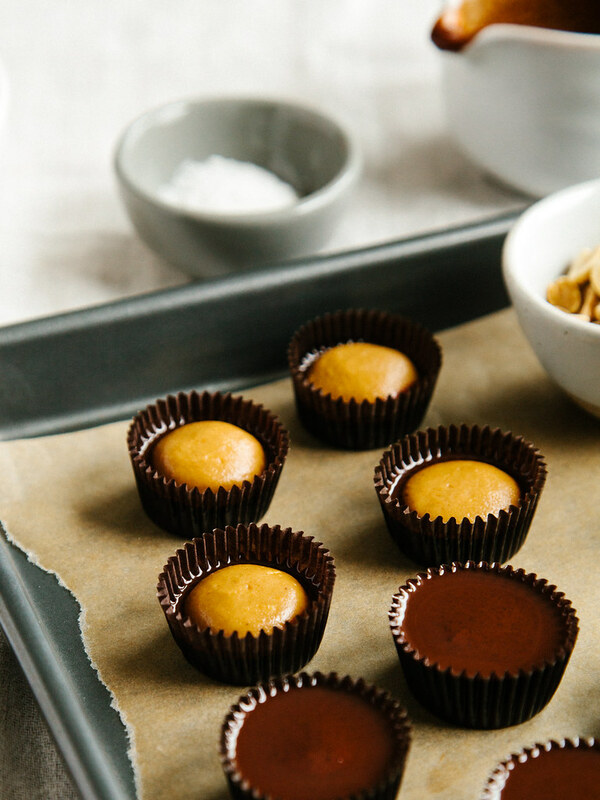 Using a 1 1/2 teaspoon cookie scoop, drop the peanut butter mixture onto the prepared baking sheet (if you don't have anymore room on your sheet, drop them onto a flat surface lined with parchment paper). 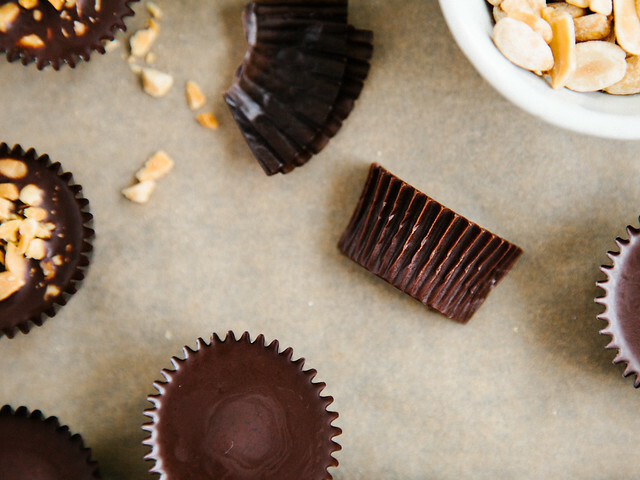 Once the chocolate has cooled, pour enough into each liner so that the bottom of each candy cup is completely covered. 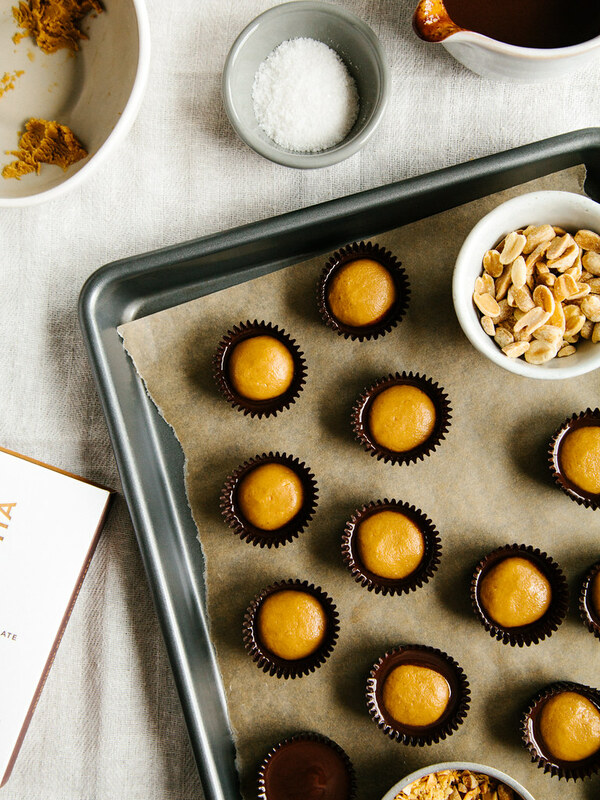 Take 1 1/2 of the peanut butter balls and roll them between your palms until they're perfectly round. Flatten just slightly and place into the liners, but make sure not to press too firmly or else the peanut butter will displace the chocolate and be visible once unwrapped. 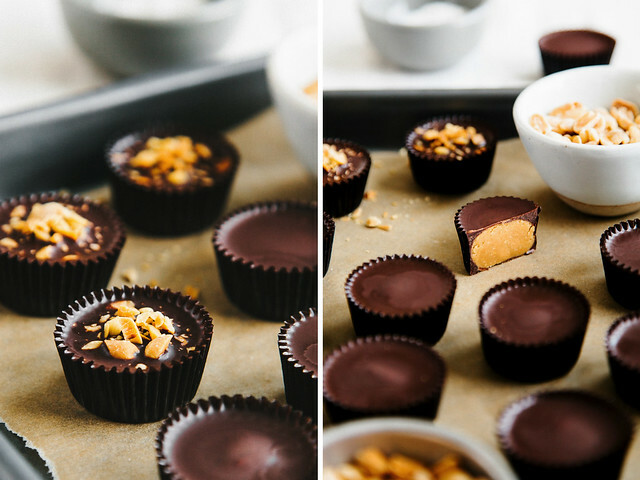 Once you've filled all the cups with peanut butter, covered with chocolate until the peanut butter is no longer visible and sprinkle with chopped peanuts, if desired. Transfer the baking sheet to the freezer for about 20 minutes, or until set. 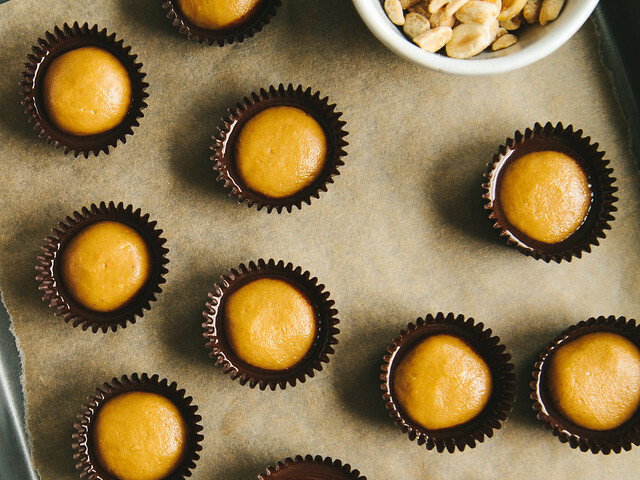 Peanut butter cups can be enjoyed immediately or stored in a container in the refrigerator for up to four weeks (but I doubt they'll last that long).